Whenever Day Spas come to mind, we immediately tend to think, “Pricy treatments” and “weird foot baths”, especially if you’re a man! At Annique Day Spa, however, we would like to remind our potential masculine clientele that, when it comes to what day spas have to offer, they could richly benefit. When it comes to understanding the intricacies of the human physique, our professionals know more than most. Day Spas employ a variety of beauty therapists, nutritional specialists and physiotherapists. 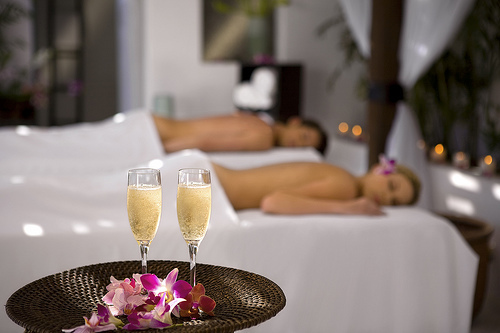 Day Spas are all about human health, both masculine and feminine. If using proper technique, a massage can do wonders for your levity and your overall state of being. Here at Annique, our physiotherapists practice good massage techniques to promote wellness. In fact a good massage aims at reducing pain, improving joint mobility, improving circulation, improving lymphatic drainage as well as reducing muscle tension. Among many types of beauty and wellness therapies, massage is definitely the most venerated, not to mention one of the oldest. The word comes from the French massage meaning “friction of kneading” and from the Arabic word massa meaning “to touch, feel or handle”. Evidence of massage being practiced have been found in the Tomb of Akmanthor dated to 2330 BC (Also known as “The tomb of the Physician”). The Chinese also practiced massage at the beginning of its recorded history, 771 to 643 BC recorded in the Huangdi Neijing or The Emperors Inner Canon, which was considered to be the fundamental source of Chinese Medicine. Massage therapy, as you can see, has its roots in antiquity and, in the modern age, we have improved upon it. In fact, today, thanks to the breakthroughs of modern medical science, we know exactly which muscles to target in order to relieve pain and promote healing. Indeed, massage therapy, if applied by a qualified professional, can aid with conditions such as depression, joint pain, carpal tunnel syndrome, fractures and oedema, insomnia, multiple sclerosis, post-surgery rehabilitation, sports injuries and much, much more! It’s relaxation at your fingertips, whether you’re a woman or a man!